The Wabash Center convened a Consultation on Teaching the Practices of Ministry to consider the goals, content, and methods of teaching the traditional disciplines of pastoral ministry: worship/liturgy, pastoral care, religious education, preaching, and church administration and leadership. Front row (left to right): Pamela Couture (Colgate Rochester Divinity School), *Herbert Anderson (Catholic Theological Union), Edward Foley (Catholic Theological Union), Jean Stairs (Queen’s Theological College), Virstan Choy (San Francisco Theological Seminary). Second row: Sharon Burch (Boston University), Nancy Eiesland (Candler School of Theology), DanielSchipani (Associated Mennonite Biblical Seminary), *Lucinda Huffaker (Wabash Center). 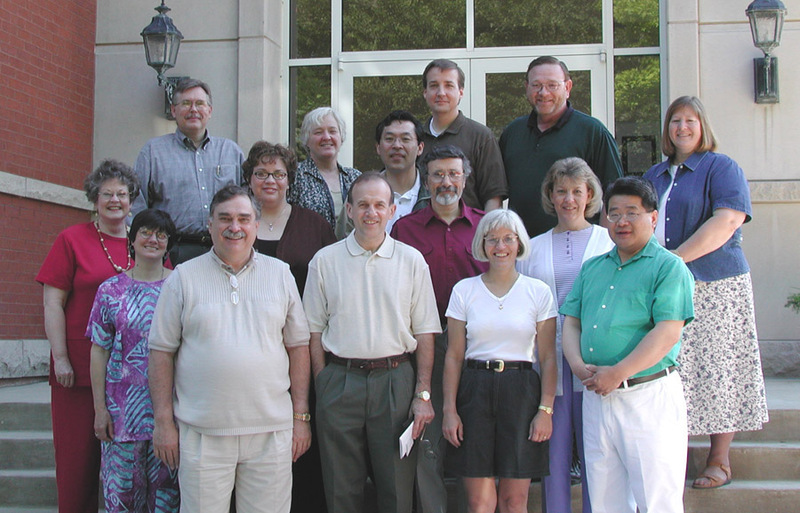 Third row: Michael Jinkins ( Austin Presbyterian Theological Seminary), Connie Kleingartner (Lutheran School of Theology at Chicago), K. Samuel Lee (Wesley Theological Seminary), James Nieman (Wartburg Theological Seminary), Fred Holper (McCormick Theological Seminary), Christie Neuger (United Theological Seminary of Twin Cities). Not pictured: Anne Wimblerly (Interdenominational Theological Center).